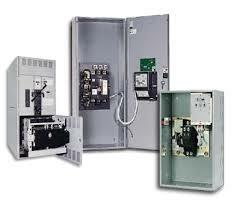 Depending on their placement, automatic multiple transfer switches are designed as per the individual requirements of the circuit and the equipment being served. 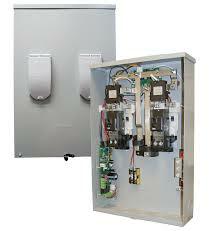 There are a wide variety of automatic multiple transfer switches available in the market to choose from. Depending on their functionality, one can choose the right switch depending on its ability to perform a particular duty. The photograph above depicts an automatic multiple transfer switch being used for a double-throw circuit, in order to minimize losses in one of the power sources, by providing ‘locking’ protection. Any open circuit on the load side in the premises of a medical facility or a building that can interrupt the incoming power supply. (This kind of power interruption generally happens in cases where single switch transfer system is deployed even in emergency areas. Using single switch operating systems in emergency areas may lead to valuable data loss, irreversible property damage and sometimes, may even cost lives). Therefore, in places where continuous power supply is deemed necessary, it is inevitable that you use automatic multiple transfer switches, which are capable of supplying power continuously with the help of alternate switches (even when the switch connected to the actual supply fails, or the circuit is open), without causing any potential damage. In conclusion, I would like to say that this is the most important reason why electrical engineers demand using automatic multiple transfer switches at places that require uninterrupted power supply. If you are low on budget, but want optimum safety in your premises, then it is recommended that you use lower current rated switches at the load ends, and use one higher rated automatic multiple transfer switch at the mains (incoming end). This combination can be very economical and safe at the same time, without being heavy on the pocket. Interesting, isn’t it? Do you agree with this essay? Tell us in the comments section below. 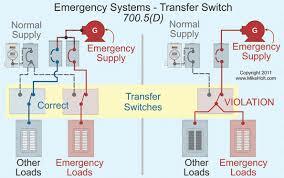 or copy this trackback: http://engineering.electrical-equipment.org/safety/need-for-multiple-transfer-switches-for-emergency-and-standby-power-generation-systems.html/trackback from your own site. Define Multiple transfer switches. Is it operating many Transfer switches by single hand/auto mechanism or single switch operating many times like auto recloser. I have come across one which operates many transfer switches by a single mechanism in a forum where 2 generators and utility feed 2 loads. I read with deep interest and would like more infos where to buy such products and if possible contact persons.